From Kirstenbosch, the national botanical garden at Africa's southern tip, Leucaspermum reflexum var. 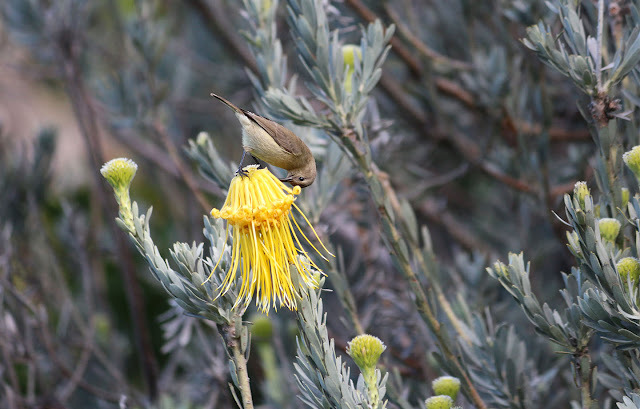 lutea (skyrocket pincushion) with female sunbird occupant. There have been many beautiful clear days in Cape Town (which is typical of winter, in short, bright bursts), but it's time we had more serious rain, after a stormy start to last week when it poured. The local vegetation needs it, the dams and the farmers still need it. 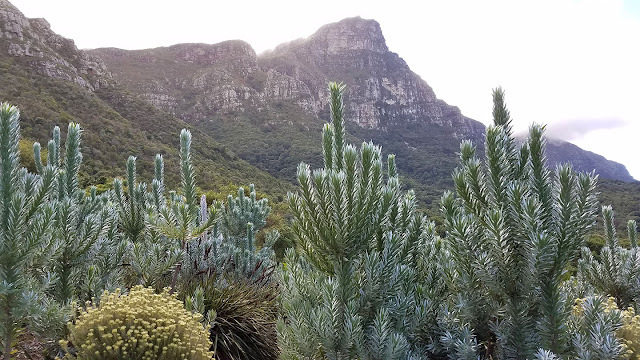 Ghostly, glorious silver trees, Leucadendron argenteum, rare and endangered, and endemic to the Cape peninsula, this hook of land where a large city, flats, wetlands, and a mountain range share space, with more and more of the latter being developed. I'll try to post more regularly, but time is short and there is much to do. I love the "ghostly, glorious silver trees"—thanks for sharing! I'm hoping for rain for the Cape peninsula, just as we're hoping for rain in Michigan. I love your posts from South Africa (and NYC). They show the diversity and beauty of the country. Totally agree with Kath. Your lovely posts broaden my world, Marie. Hope your parents are doing well.